Your cultural host in Rotterdam. Join our experienced and enthusiastic guides for a tour of the art and culture in town. Discover all the ins and outs of the high-profile design by Rem Koolhaas in a building tour or book a guided tour though one of the exhibitions. In the heart of the city you’ll find The New Institute, museum for architecture, design and digital culture. Bekijk ons aanbod aan tours. Join our experienced and enthusiastic guides for a tour of the art and culture in town. 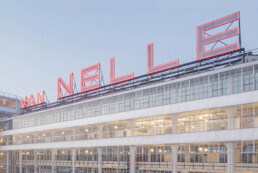 They will tell you everything there is to know about the exhibitions in the Kunsthal and The New Institute and show you the rich collection of art in the public space. Check out the special tours MuseumGuides has to offer. 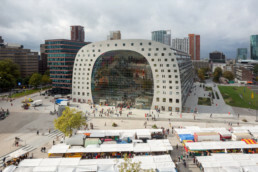 This category is regularly updated to highlight the variety of tours which are available in the cultural scene of Rotterdam, the Kunsthal and the New Institute. De Kunsthal neemt je deze lente mee in de fascinerende wereld van het sci-fi genre met de tentoonstelling Science Fiction - A Journey into the Unknown. 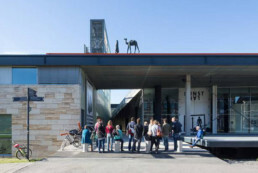 Een gids van MuseumGuides neemt je mee op pad door de Kunsthal en laat je in een rondleiding door de tentoonstelling Trouble in Paradise kennismaken met het bijzondere universum van verzamelaar Rattan Chadha. De Kunsthal presenteert met Picasso op Papier een onderbelicht deel van het oeuvre van de meester van de moderne kunst. Daarnaast is de prentententoonstelling het allereerste project in de reeks Boijmans bij de Buren. Ter ere van het 100-jarig jubileum van de legendarische Bauhausbeweging presenteren UrbanGuides en Museum Boijmans van Beuningen dit voorjaar een tijdreis door het Rotterdamse interbellum. 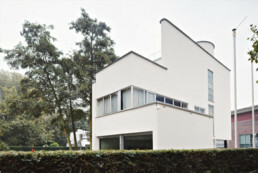 Om het 100-jarig jubileum van Bauhaus extra luister bij te zetten presenteren UrbanGuides en Museum Boijmans van Beuningen in maart en april een serie van zes lezingen over Rotterdamse pioniers van het modernisme. Together with a MuseumGuide, you’ll be able to explore the Kunsthal in different ways. In a tour of the building, you’ll discover all the ins and outs of this high-profile design by Rem Koolhaas. If you’re opting for a tour though one of the exhibitions, a professional museum guide will make you acquainted with all the artworks and their remarkable stories. 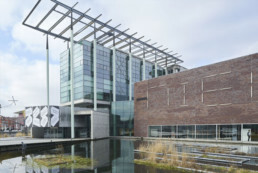 Together with a MuseumGuide you’ll be able to explore Het Nieuwe Instituut in various ways. In a Museumparktour you get to know everything about the architecture of the building by Jo Coenen, but also about the white villas and the rest of the park, the former Land of Hoboken. In a tour through one of the current exhibitions a professional guide will tell you all about the concept and the objects on display. The fact that Rotterdam has a broad cultural playground is widely known nowadays. The city’s cultural axe leads you from the Museumpark to the Witte de With street, along renowned art institutions and small-scale galleries. From the Vasteland until Kruisplein you’ll find a route by Sculpture International, one of the many examples of the vast collection of art in the public space. Rotterdam seems to be pre-eminently an architecture city, but there is so much more to discover in its streets. Apart from the quickly developing skyline full of residential towers and sky scrapers, you can find a vast collection of architecture from the post-war decades and, what might be even more interesting, lots of matching art works. Join our experienced and enthusiastic guides for a tour around town. They will tell you everything there is to know about the historical industrial heritage, show you the progressive contemporary architecture and let you enjoy this metropole along the Meuse to the fullest.